What is a propaganda party? It’s where we get together to make and share graphic and informational material that we can use in our organizing work. Join us on March 5th at Interference Archive! This is a time to meet people, learn about the work different organizations are doing, and pick up flyers, stickers, posters, buttons, and more. All this material is free to you, and we encourage you to grab a drink and meet some new people. If you, or an organization you are a part of, are creating material like this, please feel free to bring some to share. Or, send us an email to info@interferencearchive.org and we’ll see if we can organize a volunteer to come pick it up. At our last propaganda party, Inaugurating Resistance, over 1000 people came through and the event was covered by CNN and the New Yorker. Why do we use the word “propaganda”? “Propaganda,” from the same root as “propagate,” refers to information that is shared in support of a cause. In modern times, the word propaganda has been weighted with negative connotations; we aim to reclaim the word. Our daily lives are saturated with supposedly “neutral” material that implicitly supports existing power structures. We use the word propaganda because we have no desire to feign neutrality. What thoughts, feelings, and messages would you like to propagate? Who is invited? Everyone! Bring your friends if you’d like; come on your own to meet new friends. If you want to come on behalf of an organization that you work with, please feel free to bring any material that you’d like to distribute to help other people connect with your cause. Who has this been organized with? 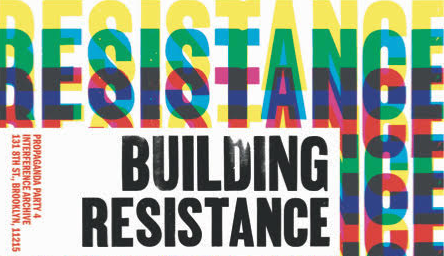 Building Resistance has been organized with the following partner organizations: Amplifier Foundation, Arts & Democracy, Kayrock Screenprinting, Print.Organize.Protest, Radio Free Gowanus, Radix, and Wasp Print.